But please do come back to this website to book your vacation so you can avoid the 6 – 10% Booking Fee that HomeAway, VRBO, and TripAdvisor now want to charge you (a tax on your vacation!) to book A Dream Come True! It is better to deal directly with a professional owner who has your best interests at heart. When you book directly with A Dream Come True Villa at this website, you can take advantage of SPECIAL OFFERS only available on this website! Where do we begin singing our praises of this marvelous place? We were in complete awe of the villa from the pictures we saw, but they truly don’t do the place justice. You feel like you own the cliffside and bay – so secluded! We had hurricane scare at the beginning of our trip, but we were completely taken care of. Germaine called numerous times to make sure we were okay. The best snorkeling was in our bay. We spent so much time playing in the pool. The view was so spectacular from the pool we never wanted to get out. We had four incredible Scuba Dives to Ginger Snaps, Middle Chromis, and the RMS Rhone (a must!). Because we loved our villa so much, we cooked most of our meals at home. We hope to return to this beautiful piece of paradise SOON! It was the absolute perfect home away from home! Thank you for the most relaxing week! It took a couple of days to get on island time – and also hard to leave the villa! Everything we need was here: cool breezes, fabulous views. Ventured to The Baths, Spring Bay, Devils Bay, Pond Bay and hiked to the Peak. Best snorkeling right in front of the villa. We snorkeled to Pond Bay and back for a great workout! Puck prepared a nice meal as we celebrated Aubrey Marie’s 1st birthday. One we’ll never forget. We promised to bring her back for her 16th! Germain does an amazing job of cleaning and keeping the house beautiful. Thank you for a vacation we will never forget! This place is fantastic! This is our 3rd trip to the BVI: 2 weeks on a 72 ft. sailboat, 2 weeks at Bitter End Yacht Club and 2 weeks at this villa. This was the best place we have stayed in the BVI. We would go on about one excursion a day (snorkeling, the Baths kayaking, island hoping etc.) and go out to dinner at one of the great restaurants about every other night. We always made sure we were back at the villa in the pool having cocktails at sunset. What a way to spend my 70th! The place has wonderful views, fantastic landscaping, and is furnished beautifully. Germaine, the owner, was fantastic and made sure everything went smoothly. We will return to what truly is A Dream Come True. Thank you for another great week @ Dream Come True. We spent it with family and friends celebrating our 35th wedding anniversary (we honeymooned at Biras Creek!!) Not a day went by this week that the topic was not brought up about how soon we could get back …and we will! Third stay at ADCT! My husband and I had the wonderful opportunity to be invited to stay at A Dream Come True Villa as guests of our dear friends who were celebrating their 35th wedding anniversary. It was our first visit to the British Virgin Islands and we had the best vacation experience ever! The villa is gorgeous, well maintained, and the views of the Caribbean are spectacular. Since my husband and I live on the West Coast, we have visited the Hawaiian Islands several times but I have to say that I can’t wait to return to this beautiful island and Germaine’s villa. We thought Hawaii is the best place to visit on vacation, but now Virgin Gorda and A Dream Come True Villa are our most favorite places on Earth. My husband and I had the pleasure of staying at this gorgeous villa to celebrate our 30th wedding anniversary and we couldn’t have asked for a more romantic setting. The villa is well maintained and offers unobstructed views of the turquoise waters and white sandy beaches of the island of Virgin Gorda. The bedroom suite we stayed in was nicely furnished and the outside showers were amazing! When my husband and I weren’t relaxing in the infinity pool, we enjoyed taking the kayaks out that the villa provided to the neighboring beaches. This was our first visit to the British Virgin Islands and we totally fell in love with the island, the spectacular views and the peacefulness we felt immediately upon arrival at the villa. Hawaii had been our favorite place to visit to experience tropical paradise, but after spending a week at ” A Dream Come True” my husband and I decided Virgin Gorda is now our preferred vacation destination and we can’t wait to get back here again. “Where do we begin singing our praises of this marvelous place? We were in complete awe of the villa from the pictures we saw, but they truly don’t do the place justice. You feel like you own the cliffside and bay – so secluded! We had hurricane scare at the beginning of our trip, but we were completely taken care of. Germaine Fritz called numerous times to make sure we were okay. We loved snorkeling in our bay as well as Mango Bay and Little Dix. Had four incredible Scuba Dives with DIVE BVI to Ginger Snaps, Middle Chrimis, and the HMS Rhone (a must!). Because we loved our villa so much, we cooked most of our meals at home, but had dinner out at Hog’s Heaven (amazing view), Rock Cafe (great pizza), Coco Maya (stellar atmosphere). We hope to return to this beautiful piece of paradise SOON! It was the absolute perfect home away from home! We had a wonderful vacation in Virgin Gorda & loved our stay at this beautiful villa. It had everything we needed! We enjoyed using the kayaks to visit nearby beaches & spent many evenings enjoying the sunset from the pool & back veranda. Puck cooked an amazing dinner for us and Germain kept everything clean & tidy. We enjoyed our trip very much and highly recommend A Dream Come True. We feel like we are part of your family! You took such great care to ensure a memorable and fabulous week for us! It has been the trip of a lifetime! Thank you so much! Germaine, thank you for allowing us to stay in your beautiful home! Not only is this place the most beautiful villa, you have made it so comfortable for a family of four with a toddler and child! Every day they couldn’t wait to swim in your pool and go swimming! We enjoyed relaxing movie nights and the comfortable rooms. The best was Savannah Bay and Mahoe Bay at the most beautiful beaches we have ever seen! This was a Dream Come True for our family. We thank you dearly. Amazing friendly staff as well as Puck (food was amazing!). God bless you. It is apparent how much TLC you all have put into the property. Our housekeepers and Gino have been wonderful as well. Happy Independence Day! We are going to celebrate by grilling here and enjoying our last day in paradise. The four of us looked forward to this trip for 9 months. We thought it would be impossible to exceed our expectations, but your villa did just that! The villa was laid out for everyone to have privacy and everything was thought of to make our vacation completely stress free. Meals by Puck were delicious, too! We’re already trying to figure out when we’ll come back again. Thank you for the complete package – luxury, beautiful scenery, great staff, (we love Germain!) and a thorough & thoughtful concierge. Sending the C— an anniversary card was above & beyond & so touching! Thank you for everything! We have all returned home and to work and all of us are just so thankful for the experience that your villa provided us. The pictures and online website do not in any way do the villa justice. We were all blown away by the views from our individual porches, and of course the great room and veranda and pool. The uniqueness of our trip (two co-workers vacationing together) forced us to find a place that would allow for alone time within each couple. The layout of the villa did just that. Oftentimes our mornings were spent together kayaking, snorkeling and swimming and then after lunch, one couple was by the pool and the other would be at the pergola reading. After the first bite of Puck’s seafood night, I went in and booked him for an additional night. His 3 meals were all fantastic. There is not a more enjoyable meal than the outdoor dining table experience with the warm breeze and the lapping waves meeting the shore. The spring swell provided a wonderful soundtrack several nights to us. The anniversary celebration was very moving and meaningful to be a part of. It was picture perfect in every way and thank you for helping us plan it. My wife will send you a picture of it. I cannot thank you enough for your help during these 8 months leading up to our trip. It was so effortless in preparing for the trip because of how well you prepared us. Virgin Gorda is a special and unique island and I hope to return sooner rather later. “ A lovely place – The views of the sea, the bougainvillea, the islands – indeed a dream. The girls lived in the water, snorkeled, kayaked. We, of course, toured The Baths – marvelous, and I found the North, complete with goats, enchanting! We shall return home with many happy memories. I loved my bed! And showering with a view! What a great vacation! The perfect combination of relaxation and sightseeing! Loved going to Spring Bay, The Baths. Everything we dreamed it would be! Beautiful landscaping, villa, views, pool, etc. We have done it all, from relaxing to reading to snorkeling and kayaking. The only problem we have experienced is wanting to leave ADCT for outings – it is truly a slice of heaven, Germaine kayaking to Savannah Bay, and Mango bay to snorkel, laying out and to swim, eating at Bitter End, hiking Gorda Peak, and going through The Baths (we hiked them from 7:30 am to 8:45 am; a flood of people coming in on our way out). My favorite was enjoying the views from this deck! Best wishes to you! Truly this place is A DREAM COME TRUE! As soon as you walk on to the property, you know this is something special. From the landscaping to the layout of the bedrooms, and den/kitchen/living room to the breathtaking views, I have never been anywhere so perfect! Celebrated Janice’s 60th birthday with all of our kids, their spouses and our grandkids. Could not have found a better layout for each family. The gas grill was wonderful. We are all big grillers in our family – cooked on it every day. Nothing like catching mahi mahi and tuna in the morning and grilling it that same night! Our family is growing and it is becoming harder to accommodate – this set-up is perfect. Our 2-year old daughter had a blast with the beach, pool, and the stairs. The baby gear was very helpful to have! The snorkeling at Mahoe and Savannah were wonderful and so convenient (especially for having a toddler! WE loved hiking The Baths and riding the waves at Spring Bay. Thank you for sharing your beautiful piece of paradise! Bliss! Our family has enjoyed this beautiful villa! My 10-year old son was in non-stop adventure mode! When all the adults gave out, he played happily in the pool. We are expecting our next child and this was the perfect place to spend our last memories as a family of three. We have truly done it ALL! The island has wonderful nooks and crannies to explore, and we hope to see it again sometime. Love from a very relaxed and tired family! A Dream Come True is a well fitting name to describe the trip I took for my 50th birthday celebration. The villa’s owner, Germaine, let us know from the initial contact that she was willing and eager to help us make this trip a memorable and smooth one for our large group of family and friends. After our short ride from the ferry station to our villa, we were met by the courteous and helpful Gino in the Mango Bay office, literally steps away from the entrance to our villa. When we opened the gate and stepped in, we all gasped at how beautiful the villa, pool and views were… The rooms were clean, spacious and each had a great view. It didn’t take the adults long to pick our rooms because all the views from the bedrooms are fabulous! The location near sapphire and pond bay was very nice and there were no crowds- it was like having our own secluded island. In the late afternoon, a few beautiful boats and yachts would park in the cove and made our picturesque view even prettier. The kitchen was well stocked with top of the line knives and lots of glassware and plates to accommodate our big crew. The pool is not huge but all you really need to float around in after a fun day at the nearby Baths or eating in the great nearby restaurants. The kayaks that come with the property gave our college age kids the perfect vehicle to take off on snorkel adventures within our view. The best part was that although we had 13 in our group, we all felt like we had plenty of room for privacy. We read lots of books off the shelves, took naps in the sun or shade by the pool and swam in the warm water. What I liked the least was that we weren’t smart enough to book Puck, the chef who made our delicious welcome dinner, more than one other time. What a character and fantastic chef. His concoctions and fusions of the food he prepared made the kids and adults alike very happy. I highly recommend you work on making this your DREAM COME TRUE. Loved the villa. Well looked after, magnificent views, well equipped, housekeeping every day. Couldn’t ask for better property. 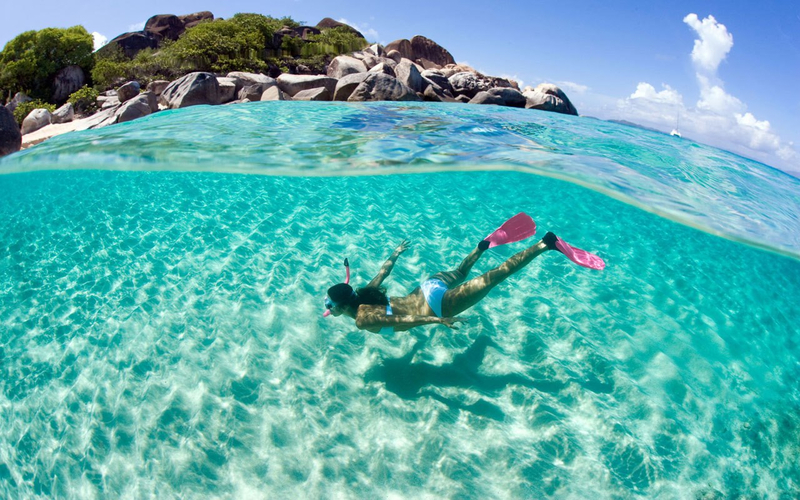 Virgin Gorda offers everything for fun holiday. Recommend Puck the island chef in providing excellent breakfasts and dinner. Loved everything; just didn’t like leaving! A dream come true was certainly just that. 15 of us have just arrived home with very heavy hearts. The villa suited us all very well. Special thanks to Puck and his team Karl and Richard. Puck’s food is amazing, our breakfasts kept us going until dinner; dinner always a delicious morsel of love and flavours! Germaine, the owner, is a wonderful hostess making sure before arrival everything is in place. She worked out our menus with Puck and booked the restaurants recommended by her. Germain, the housekeeper, comes 7 days a week and all rooms are cleaned beautifully each day. Of course the location of this villa and the view and the easy beach access is really what makes your time at a dream come true perfect. Be prepared for a holiday of a lifetime! We rented a Dream Come True Villa with family and friends from February 9th through the 16th. Without exception, everyone wholeheartedly agreed that a Dream Come True – the Villa itself, its location, its grounds and its staff – are simply unsurpassed in every way compared to any place we have ever stayed. This villa not only provides breath taking views night and day, but also provides both the togetherness needed on family vacations and the privacy one seeks on vacation. What I mean by that is there are so many living spaces on the grounds that you can be together any time you want in gorgeous surroundings or you can go to one of the 5 private balconies and relax on your own. Another unbelievable feature are the 5 outside tiled showers, where you shower in privacy overlooking the Caribbean. Doesn’t get any better than that!! Actually, it does – I forgot to mention the infinity pool – overlooking the Caribbean!! The actual grounds are unbelievable. I do not know of a resort that can compete with the landscaping at a Dream Come True. We decided to eat at the Villa almost every night, as we simply did not want to leave the Villa. The Villa is completely stocked with every cooking utensil known to man, so it is very easy to put together a great meal. A must do for diner one night is to have Puck come to cook for you. Not only was his food awesome but we loved watching him put it all together! And of course, as Germaine pointed out, Puck will deliver gallons of painkillers to you once you arrive at the Villa! They are awesome. If you are going to go out, we highly recommend taking a taxi and eating at Leverick Bay. It was delicious. We also really enjoyed Coco De Maya, which was excellent. There is so much more to say about this absolutely magnificent place and the hospitality of Germaine and her staff. I strongly encourage you to reserve your stay and have the time of your life. We did and look forward to returning! This is the nicest villa we have ever stayed in. It is luxurious, with full-service hotel quality. Additionally, one has the magnificent water views from all bedrooms and common areas; it is a place for escape and peace. For family time, or for a romantic getaway, it is the top. Can’t wait to go back. 5 stars! We cannot express how happy we were to find an estate that had five bedrooms in Virgin Gorda. Not to mention one that was absolutely amazing. The process of arranging the stay was almost effortless thanks to the excellent service provided by Germaine R Fritz at a Dream Come True Villa Rentals. All of our needs and desires were met without us even having to ask. The home is beautiful and every bedroom had a view. There is not a bad room in the place. The back patio has a view that you will never forget. The kitchen and outdoor BBQ was perfect for cooking our meals when we did not take advantage of the chef that was arranged by Germaine if we desired. Even with five couples, each pair felt like they had the place to themselves. You cannot go wrong by choosing this home as your place to stay in Virgin Gorda. We will never forget this wonderful stay. Thank you to everyone at a Dream Come True for your wonderful service! It’s rare at the end of a vacation that one can say that all of one’s hopes and expectations have been exceeded. This is one of those times. Our trip started out rough with travel delays and missed flights on our way down, but Germaine Fritz took care of everything, much like she did throughout the whole process. Any stress we brought with us was left behind when we woke up to the beautiful views of A Dream Come True. What an incredible week of kayaking, frolicking on the beaches, snorkeling, soaking in the BVI beauty, and day trips with Capt. Dave of Double D. Charters. The villa was an incredible home base that had everything we needed to feel comfortable and at home. We enjoyed the slower, more private pace of the off-season. Everywhere we went, we felt like the place was ours. We explored quite a bit of Virgin Gorda and surrounding islands and can honestly say we didn’t find a better setting than ADCT. Thanks for a great time and great memories. We had a marvelous time at a Dream Come True Villa. Every part of this vacation was easy from the first contact to the owner until we returned home. The owner is happy to help provide her personal tips and suggestion for every aspect of the trip making it easy. The home, island, and surrounding area are absolutely beautiful adding to the pleasure of it all. We especially liked the home as it provided enough of both “togetherness” for the both families and enough space that the teenagers felt independent. This was our 3rd time to Virgin Gorda, mainly because we love it so much! I can honestly say this trip was by far the one with the most personal attention! Germaine, I can’t tell you how much your “personal touches” meant to us and our trip – from the breakfast & pina colada finin’s to the meal prepared by Chef Puck! It was all FANTASTIC! Your villa has one of the most stunning views on the island. We enjoyed our vacation and our stay in your lovely home. Thank you for making our trip fantastic and making us feel right at home! The house and the view were spectacular. Germain the maid very nice and attentive. Chef Puck wonderful food. Germaine Fritz’s assistance in planning the entire trip – priceless. The hardest part of the trip was dragging people away from the house to explore the rest of the island as we had everything we needed at the house…drinks, food, pool and of course, the awesome view. Among our group, we have several more high-profile birthday’s in the near future…the email traffic has already started to go another round at “A Dream Come True”. Having traveled all over the world, and, having stayed at some of the finest hotels, A Dream Come True Villa afforded me and my family the best and most memorable vacation in all my years. Although we canvassed the island from back to front, side to side, we were still able to thoroughly enjoy adct to the fullest…at one point, I sat alone, enjoying a cocktail, admiring the beautiful view of the surrounding islands, but also took the time to visually “inspect” the villa from my position just to pick out the things that weren’t right, or didn’t fit, on were the wrong color…I couldn’t come up with anything…everything about the villa from the private entrance, to the “endless” pool, to the perfect positioning of the bedrooms, to the outside showers with incredible views, to the “common” area where we would all gather for drinks, to the beautiful structure of the landscaping…I could go on, and on, however, in a word, and I don’t say this often, but adct is perfect. We will go back. Then, we’ll go back again. Should you reserve adct, you will be very, very happy with your choice. I don’t typically write reviews, but felt the need for this wonderful experience! My boyfriend, his two brothers, and I stayed at this beautiful home in August 2012 as part of Vacations for Veterans. Without the program and Germaine’s generosity we would not have been able to stay otherwise. From the moment you arrive you know it’s a special place. The house is beautiful but the views are incredible!! I was relaxed instantly. The layout of the home is perfect, allowing you to spread out and escape to your own space (with beautiful views from every room). Oh, and the kitchen is a dream! The 4 of us love to cook so we rarely went out – instead we visited a few of the stores around the island and tried our hand and cooking some local dishes. There are so many things to do and see around the island – the Baths, the beaches, Bitter End. We really enjoyed exploring. However nothing beats walking down to the private deck and spending the day snorkeling and kayaking around the bay! One thing I have to mention – if you like to snorkel, island hop, or scuba dive, you have to call Dive BVI. Jeff and Casey McNutt were incredibly sweet and accommodating. They took us out to various beautiful dive spots around the island. The boys loved the scuba diving, though I can tell you the snorkeling is top notch as well! Germaine and her staff were so welcoming and made our planning and stay so easy. This is a vacation we will always remember. Please visit our earlier reviews: 56 Reviews on TripAdvisor, 36 Reviews on HomeAway, 56 reviews on Flipkey, and 36 Reviews on VRBO. Have our up-to-the-minute exclusive deals and villa updates emailed to you.